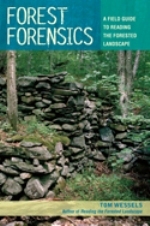 Forest Forensics: A Field Guide to Reading the Forested Landscape, by Tom Wessels, 2010. This compact book, illustrated throughout with color photos, is a field guide companion to the author's classic Reading the Forested Landscape, an interpretive guide to deciphering the past history of the region's forests. This new guide helps readers and woods wanderers find evidence of agriculture, wind, fire, logging and old growth. A great new resource for New England naturalists. 160 pp, 5" x 7 1/2."